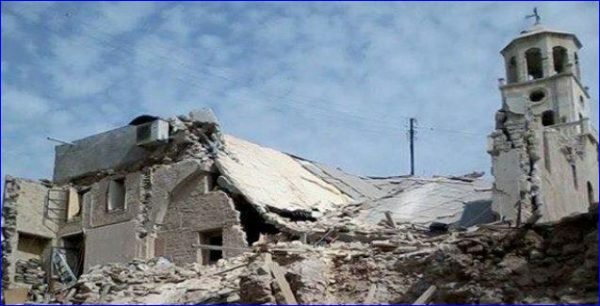 (AINA) — The Assyrian Monitor for Human Rights has released a report titled The Good Shepherd – A Report on Brutality Against Christian Clerics in Syria. The report documents the suffering of Christians in Syria, who over the course of seven years have been the innocent victims of a conflict that became a proxy war for global and regional powers. The report focuses on crimes and acts of brutality against Christian clerics from all Christians denominations in Syria, acts which were committed by unidentified persons. The reports aims to shed light on these crimes that target the core existence of Christians in the region. In his introduction to the report, Jamil Elias Diarbakerli, Executive Director of the Assyrian Monitor for Human Rights, elaborates on the history of the Christianity in Syria and its role and contribution in building Syria’s culture and society. The heritage goes back to the “first civilizations of Assyria, Babylonia” he writes. At the beginning of the 20th century, according to the report, Syrian Christians comprised 30 percent of the Syrian population. But their numbers have dropped for most of the century, caused by a variety of factors, including emmigration for political, economic, social and religious reasons, as well as a low birth rates. The current population of Christians in Syria is half a million. In 2010, according to semiofficial statistics, Christians were eight to ten percent of the total population of about 25 million. In addition, Syrian cities and villages throughout the country have been abandoned by their Christian inhabitants, such as Raqqa, Deir El-Zor, Ras al-Ayn, Ma’loula, and the Assyrian villages of the Khabur Basin, leaving hundreds of thousands people internally displaced or forced to escape to Lebanon, Jordan, Egypt, Iraq, Turkey and elsewhere. The persecutions and acts of brutality against the people profiled in the report are only a portion of what the Christians in Syria have suffered so far. With this report the Assyrian Monitor for Human Rights intends to bring to the attention of the international community the suffering of the Christians who became a specific target. In addition, the report aims to appeal to the international community to end the chaos in Syria, protect the victims of genocide, and preserve what is left of these historic communities before it is too late.